To me, sports is not about trophies. It’s not about money. It’s not about saying you’re better than somebody else. The beauty of sports is who it makes you become. It’s about character. 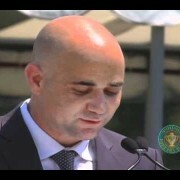 Watch the recent Tennis Hall of Fame Induction Ceremony with one of my favorite athletes, the great Andre Agassi. Enjoy. My mother, the late, great Mary Tseng was, and is, one of my she-roes. As an immigrant from Shanghai, China, my mother arrived in the United States without a great command of the English language, or a lot of money. In fact, she started out working at White Castle in the Bronx. Then, after my sisters and I got older, she worked an entry level job performing data entry. Even though she didn’t make a lot of money, she was able to save more than most people. Her goal was to raise a family to the best of her abilities. And I feel she did just that with my two sisters and myself. Unfortunately my mother passed away a few years ago after fighting cancer for nine years. My mother was and is one of my she-roes. I think when we shift our focus from “what can you do for me?” to “what can I do for you?” our world changes. As a by-product, our results change—in relationships, in sports, in sales, and in school. Everything mothers do comes from a place of love. But sometimes the message is lost because children hear that they need to get better grades, clean their room or can’t get that new cell phone. But there is always a good reason for that. And that reason is to help make their child the best that they can possibly be. As children, we need to realize this, be grateful and try to make our mothers proud, every day. I know I try to. I like taking notes at movies. There is no such thing as bad student only a bad teacher. I know coaches that tell their players to call the ball out when it is close. They teach them to be jerks on the court. They think winning is everything. The answer is never, I want to be #1 in the world, or I want to be a millionaire with five homes and a boat. We may not all be coaches, but we are all teachers. We may be teaching our children, our friends, our parents, our fans, our employees or a stranger on the street. But what are we teaching them? People say, nice guys finish last. I say, nice guys are winners before the game begins. Do you play to get a lot of trophies? Do you work to make a lot of money? Do you study to get a lot of A’s? Don’t get me wrong, trophies, money and A’s are desirable things to have, but they should not be the ultimate goal. I think that what really matters is what kind of person you become. Trophies, money and A’s will not last forever. But your character will. Training yourself to go all-out, striving for constant improvement and enjoying the process is success to me. https://www.edtseng.com/wp-content/uploads/2013/06/default2.jpg 300 300 admin https://www.edtseng.com/wp-content/uploads/2013/06/TsengLogo211-2.png admin2010-06-23 20:37:172010-06-23 20:37:17MESSAGE #1065 WHO ARE YOU? I have seen some amazing things in sports. I was at David Cone’s Perfect Game, Joe DiMaggio Day at Yankee Stadium, several World Series games, the US Open, Australian Open and countless other events on television. But yesterday I saw the MOST amazing thing. Armando Galarraga threw a perfect game for the Detroit Tigers…but umpire Jim Joyce took it away from him. On what should have been the last play of the game, a ground ball was hit to first baseman, Miguel Cabrera, who threw it to Galarraga covering first. That should have been the final out. Game over. History made. But the runner was called safe. To be honest, at normal speed, I could not tell if the runner was out or if he was safe. But on replay he was clearly out and Galarraga clearly should have had a perfect game. Joyce blew the call. After the game, Joyce asked to see the replay and saw that he was wrong. He then went to find Galarraga and apologized. I respect Jim Joyce for that. But the best play in the whole game was Galarraga. After the blown save, Armando was surprised, but just laughed and then got the final out. Galarraga could have given Joyce a piece of his mind and told him where to go, but he didn’t. That’s mental toughness at it’s best. There is no polite way to say this: Joyce blew the call. Galarraga caught the ball in plenty of time, even if it wedged precariously in the webbing of his glove, and scraped the base, even if inelegantly, with his foot. Immortal fame was his. Jim Joyce took it away. He called Donald safe. No sign that Galarraga juggled the ball. No sign that he missed the base. Just safe. Pure and simple safe. Umpires miss calls. It happens. Nobody feels worse when an umpire misses a call than the umpire himself. They are proud men who strive for a 100 percent success rate and are bound to be disappointed. Upon seeing a replay, Joyce was crushed. It was a classy move by Joyce, who also apologized to Galarraga personally. The pitcher told a Venezuelan reporter that Joyce was crying when he offered him his apology. Yes, Galarraga’s perfecto would have been impressive, but to be honest with you, his reaction to the missed call was the most impressive thing I have ever seen in sports. Well, I think Tiger Woods definitely said the right things in his recent public statement, but communication is only 7 percent the actual words. 38 percent is the tone, and 55 percent is body language. I respect Tiger for admitting the truth, unlike some celebrities, but I wanted to see some emotion. I wanted to hear him speak from the heart. His tone (38 percent) and his body language (55 percent) were just like his golf game, unemotional. Many say that he didn’t get emotional because he’s not an emotional guy. I suppose that’s true, but I’m still not convinced – did he REALLY need to read word-for-word? Did he really need to be that monotone? Perhaps it was part of his poker-face and he didn’t want to show any weakness. I asked my friend, Tom Jolly, Sports Editor, New York Times what he thought about Tiger’s statement. Nobody knows how heart-felt Tiger’s statement was, only Tiger knows that. But I do think that he will be back and his game will be stronger than ever. And I hope that one of Tiger’s goals is to turn this whole fiasco into something that everyone can learn from, including Tiger. That would be the only way he could win my respect back. What are YOUR thoughts on Tiger Woods? Today’s message is especially dedicated to the great Derek Jeter. Many people ask me what it takes to be a winner. Most people think winning is the result you get, whether it’s money, a trophy, grades or a raise. I call those things by-products. Winning, in my mind, is your effort. If you do your best…how can you do any better? If you have the right attitude, you can overcome any obstacle or condition. And if you have character, well then you’ve got it all. After the final out and some celebration, the New York Yankees and their captain, Derek Jeter, took the microphone at the pitcher’s mound. Jeter spoke on behalf of the team and he didn’t talk about how great they were, or their 26 World Championships. He talked about what an honor it was to put on the pinstripes. And talked about how it was a team effort from players present and past. And most importantly, they thanked their fans…and they meant it. That’s class. Many people hate the Yankees because they have won so much and they have such a big payroll. I can see that. But I’m a Yankee for life because they have class. They are professionals. And last night confirmed it. Yankee Stadium…thanks for the memories. Hope to see you tonight at the first book signing of “Game. Set. Life.” at Amalfi’s Restaurant in Lawrenceville, 7-9 PM.